Has Your Love for Vampires Faded? Every few decades we are hit by a beautiful vampire storm and everywhere we look we are surrounded by the undead. The vampire craze comes and goes, one moment it’s all anyone can talk about, and the next it’s back lurking among the shadows waiting to come again. We saw this after the publication of Anne Rice’s legendary novel Interview with the Vampire, during the hit show Buffy the Vampire Slayer, and most recently, with the Twilight phenomenon. Every few years the lust for vampires sparks again and then slowly drifts away. It appears that the current vampire craze is slowly fading away, and with it, is your love for vampires also fading? I recently read an article that spoke about how bland and boring vampires are now that the media has sucked dry every last penny they could from the craze. They wrote that with vampires being everywhere, they have become over-sensationalized and now many are sick to death of them. I agree in some sense, yes the vampire fad is dying out, but it’s not quite dead yet. We still have a few big blockbuster films on the way, like Breaking Dawn: Part 2 and Abraham Lincoln: Vampire Hunter, and there are countless fans dying to see those two. So, vampires aren’t done yet, and honestly, they never will be truly dead. The article did get me thinking and wondering if your love for vampires had died out. I also thought on my own feelings on vampires after the whirlwind craze. 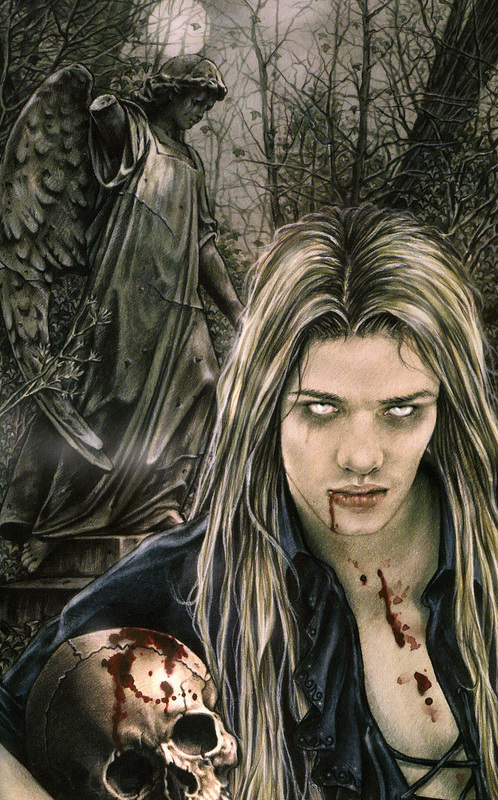 Has my love for vampires faded? No, it hasn’t. However, my vampire expectations are much higher now. After reading hundreds of books on vampire and seeing countless movies I have seen too much and therefore expect something new. I still love vampires, but it will take something truly entertaining and unique in a book, film or show to really impress me now. So has the vampire craze affected me, yes, but only my expectations, not my love. I want to see something that hasn’t been done hundreds of times before. I don’t like being bored. Personally, I feel that even though the love for vampires has faded out of the eye of the general public, there are still countless true vampire fans. Vampires will never truly die out. Some may have lost their love for vampires, but not all of us. How about you? Has your love for vampires faded? I have loved vampires for many many years.. I’ll love them til the day I die.. or be undead, if they were real..
My love for vampires has never faded, and I suspect it never will. What sometimes happens is something will be overplayed — like a Justin Bieber (or Adele, or Gotye, etc..) song on the radio — and I’ll grow temporarily weary of the specific title or format, usually Twilight or the young adult romance, and revisit Salem’s Lot or 30 Days of Night or Fearless Vampire Killers for a sanity check. Btw, I highly recommend if you haven’t seen all three (add Blood & Donuts! ), give them a watch. I haven’t lost my love for vampires! I don’t think I ever will. The next evolution of the vampire waits in the shadows (as always). My love for vampires will never die. It’s a part of me. Here’s the thing….I’ve always loved vampires. As well as other monsters. But they are my favorite. It all started for me when I saw The Monster Sqaud and The Lost Boys at a very young age. And I remember staying up late to watch all the old Hammer Dracula movies with Christopher Lee. Bela Lugosi was pretty cool too. LOL. When I got older I read books like Bram Stok’ers Dracula, Anne Rice’s books, as well as Salem’s Lot by Stephen King..just to name a few. I’ve read tons of vampire novels and seen tons of vampire movies. So, No my love of vampires is not fading. I have to admit though, that I think Twilight almost killed the whole vampire thing! I’m sorry to say it, but I HATE that thing!!!!!! It’s a corruption of the whole vampire genre. Anyway, that set aside, no, my love of vampire stories has not faded.